A lot of you have said you want to see more photos, so I thought I’d put together a photo blog of the christening ceremony, boarding the ship, and a tour of our stateroom. Tinker Bell starts off the Christening Ceremony! This was a great moment – Tom Staggs spoke about the crew members aboard the Dream, and how they will be helping to make guest’s dreams come true, and then the crew members came to the side of the ship and cheered and waved flags. Tom Staggs and Captain Mickey introduce the Disney Dream’s Godmother, Jennifer Hudson. In the cruise terminal, waiting for our boarding group to be called. Plaque on the wall just as we stepped off the gangway and onto the ship. The Atrium is three decks high. To really see it, go up to deck 4 or 5. Heading to our stateroom – the midship elevator lobby on deck 8. Getting ready to open the door for the first time! Just hold your Key to the World card in front of the black sensor box. Our stateroom!Here’s a stateroom tour, from stepping into the room out to the veranda. We were in a Category 5 – Deluxe Oceanview Stateroom with Veranda. It was on the starboard side, just a little bit forward of midship. Place your key card just inside the door to enable the cabin lights. Toilet room to the right. Closet with safe to the left. Bathtub and shower room to the right. Sink and vanity in tub/shower room. Queen bed on the right. Pillowtop mattress with a duvet – so comfortable! It was a dream bed. Artwork on the wall to the left. Sofa on the right – converts to a bed. The desk, with ship information, light switches and electrical outlets. “Wave Phone” walkie talkies – these can be used aboard ship to communicate with those in your party, or those in other staterooms, if you know their number. Veranda on the starboard side.There’s still lots more photos to come! If you have specific things you’d like to see please let us know – use the section below to submit a comment, or send email to allearsnet@yahoo.com. Are meals included during the excursions, or do you have to return to the ship for meals? ALLEARS: If meals or snacks are included in an excursion the description will specify. If it doesn’t than they will not be. My adult daughter and I just returned from a 3 day Bahamas cruise on the Dream. My first cruise ever. The ship is gorgeous and we had a deluxe ocean view with veranda #6080. It was comfortable (I slept on the sofa bed) and no detail is missed. Very smooth ride except the last night when the sea was a little choppy. Took Dramamine as a precaution and was fine. My only criticism would be that the wait for an elevator could get long and frustrating especially after large crowd activities like the shows, which themselves were absolutely fantastic! I am not particularly a Disney fan but you don’t have to be to thoroughly enjoy this cruise. I would like to know which rooms and at what time of the year is it best to travel (and when to book). We are 4, two adults, two kids under 12. We are on a tight budget. Any suggestions from those who have done Dream Cruise before? greatly appreciated! 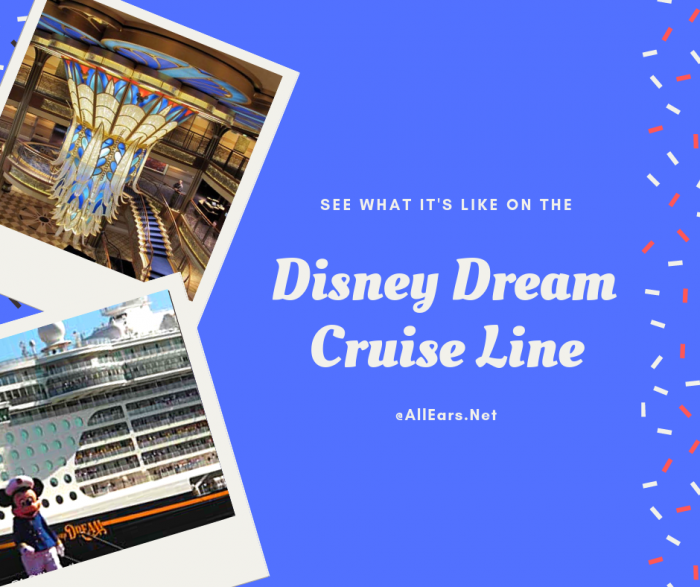 Laura replies: I’d recommend that you contact a travel agent who is familiar with the Disney Cruise Line (AllEars recommends Mousefan Travel – I use them to book my cruises). In general for Disney cruises, the further out you book, the lower the rates are. But just like the resorts there are “high” and “low” season, so the prices are lower if you take a “low season” cruise, which is typically times like October and early November and most of January. On most cruise ships your lowest rate will be an inside stateroom, but that’s not always the case on the Disney Dream because of the popularity of the virtual porthole. I personally like the Deluxe Oceanview Staterooms – no verandah, but you still have a large porthole. There aren’t very many of those on the Dream, though, so you have to book early, and they are sometimes cheaper than the inside staterooms. I will be sailing in september of 2012. Could you tell me what the cigar louge is like and can i Purchase cigars for take home. my boyfriend likes them and he will be staying home to look after our dogs and cats. Laura replies: I’m sorry, but I don’t know anything about the cigar situation on board. Thank you so much for all of the information. We are going on the Disney Dream 4 night cruise this December and this is exactly the room that we have booked. So excited. Wish I could tell the kids, but it’s a suprise!!! AllEars: The Disney Fantasy, which sets sail in 2012, will have a Bibbidi Bobiddi Boutique. At this time, that is the only ship scheduled to have one. Laura replies: Stacey, thanks for sharing that information! thanks for all the info. we will be taking the cruise in 2 weeks. my husband uses a sleep apnea machine–just wondering if you knew if there were any electrical outlets by the bed? thank you for all the pics. I am trying to plan 2012 Cruise. This would be my first cruise ever. Are there any pics of the pull down beds? do you know the weight requirements for those beds? Laura replies: We have a photo of the pull-down bed here: http://land.allears.net/blogs/lauragilbreath/dream_primer_03.jpg. I do not know if there is a weight requirement for the bed – but since the occupant has to climb a ladder to get up to it, that might make it self-limiting. Can you please post pictures of the pull down bed? Geat info. Couple of room questions. We have room # 6568 on starboard side a few doors back from where you were. Is this location midship enough for someone who gets sea sick or should we move MORE midship? Also, in pictures it looks like the life boats stick way out on side of ship and may block our view looking down from just one level above them (deck 6) what did you see when you looked down from deck 8? Lastly, did the ship back-in to Castaway Cay…in other words – were you on the side with the island view?? Laura replies: I found the ship to be very stable where we were – there were times when I couldn’t feel any motion at all even when we were moving. Being more towards midship, plus a couple of decks down will lessen the motion even more. I didn’t not notice the lifeboats, but most of the time I don’t think people look straight down at the water, so they aren’t in the way. Yes, on Castaway Cay we were on the side of the ship with the island view, but we were far enough forward that it wasn’t a great view – it would have been better if we were further back. Hope that helps. We will be cruising on the Dream for New Year’s, and we have the same type stateroom, except it is on the 10th floor. We were assigned to a room that has an adjoining room door entry…. do you know if those rooms have a different layout, or less usable space (to accommodate for the door opening)? Laura replies: We had a room with a connecting door but it didn’t seem to make any difference in the usable space – unfortunately none of us took any pictures of the stateroom that showed the door. My husband, l3year old granddaughter and I will be on the DVC cruise in September…First Cruise Ever for all. Excited and overwhelmed. Glad to know about the locking door. The whole idea of traveling on water takes my breath away. Hopefully, once on board I will melt into my usual Disney state of mind. The wave phones sound great… Hurry September so I can enjoy rather than fret. Thanks for all the wonderful info! We are sailing April 2012. Can you tell me how the door to the verandah locks? I want to be sure my two young children cannot open when we are sleeping! Scary thought!!! I’m sur Disney has taken care of that, but I’m curious. Thanks! “I had trouble opening the door — I don’t think a little kid could! As I recall, there’s a lock above the door handle that has to be twisted, so the kid would have to be fairly tall. The door handle was hard to turn as well, took me a while to figure out. Can you tell me, how many wave phones are in each stateroom? Do they allow 1 per person staying in that room? Laura replies: There are two Wave phones per stateroom. You can rent additional phones if you need them. I was wondering if you will be able to get some photos of the accessible rooms. I plan on taking my daughter for her 5th B-day and would need that type of room. Laura replies: We are certainly hoping to get photos of the accessible staterooms. Deb Wills is still on the ship, and we will be posting whatever photos we are able to get once she returns. Do they have walkies talkies om the magic or is it a new thing for the dream? Laura replies: The Wave phones are already available on both the Disney Magic and the Disney Wonder. I am so excited!! Cruising 9/11/11 on the Dream, love the photos and all of the blog into. I had no idea about the wave phones, that is an awesome touch. Are the drink stations (for sodas) in the forward or aft portion of the ship? And are they near the pools? Thanks for the awesome pictures! We will be in 8508 in 500 days so seeing your location is great! Did you notice much rocking at night while sleeping? Laura replies: The beverage stations are on deck 11 aft, just outside Cabanas – the same general location they are on the Dream and Wonder, except two decks higher. So yes, they are near the family pool and Nemo’s Reef. There are beverage stations on both the port side and the starboard side of the ship, vs. port side only on the Magic and Wonder. I found the ship to be VERY smooth – I think part of it was that we had calm seas, but even so. I woke up about 3:00 a.m. the first night and wondered if we had arrived at Castaway Cay already because I could feel no motion at all! We were still moving – I just couldn’t tell. The pictures are great. How far out into the room does the couch go when it is made up into a bed? Can you still get out to the balcony? Laura replies: There is still room between the desk and the bed to get out to the balcony. Thanks for the info…We are wanting to book for October. We are married couple with no children – is there enough to do to keep us busy? Laura replies: My husband and I were not interested in Disney cruises for a long time because we thought the ship would be overrun with kids, but that’s not the case at all – they have their own spaces, plus there are adult-only areas on board the ship. We always find plenty to keep us busy – we still have yet to have time to watch a movie while on board! Or spend much time in the clubs at night. Thank you for all of the photos and report. I really enjoyed all of the photos. It is so cool to see all of the new changes in the stateroom, too. I really miss not going on a Disney Cruise. Deb really looks very happy in her photo. Will there be Disney characters on the ship to meet and greet (like Pluto, Mickey, Minnie, etc?). This is my 3 year olds favorite thing to do and Pluto is her favorite character. Laura replies: Oh, absolutely – there are lots of Disney characters on board! Meet and Greets are scheduled in the Atrium throughout the day – check your Navigator for times. A couple of the princesses walk through Royal Palace during dinners there. Did you happen to get a photo of the pull down bed the ladder goes with? We’ll be using it on our cruise in November and want to show the kiddos. 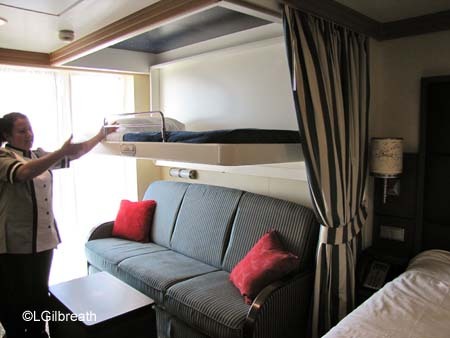 Laura replies: There is a photo of the pull-down bed in my “Disney Dream Primer” blog at: http://land.allears.net/blogs/lauragilbreath/2011/01/disney_dream_primer_for_repeat_1.html It’s about 1/4 of the way down the page. How nice! The ship reminds me of the Wonder, but those walkie talkies will make it alot easier to break off from the group and explore. 110 DAYS UNTIL WE GET TO EXPERIENCE IT! Can you bring wine, soda, water aboard? Are there ironing boards and irons? Laura replies: Yes, you may bring beverages aboard. An iron and an ironing board is available in each of the laundry rooms – they may only be used in the laundry rooms. What an absolutely beautiful ship! Thanks for showing it to us. The staterooms look so nice. Interesting there are tubs now. Did you happen to get a picture of the virtual portholes in the inside staterooms? I would like to see one for your next blog if you have it. Also, the quick dining options on board. What are those and selections available? Laura replies: We do not yet have any photos of the virtual portholes, but Deb Wills will be staying in one on the Maiden Voyage, so will have lots of information about it after that. The quick service options are pretty much the same as on the Magic and Wonder – pizza, burger grill, salads/wraps/sandwiches. There is also a smoothie bar, but there is an additional charge for those. Those Wave Phone walkie-talkies are a cool idea! Do they charge you to use them or are they complimentary? Laura replies: They are complimentary. Will stateroom doors take magnetic decorations? The walkie-talkies are fantastic! Now we can leave our cell phones in the safe. Perfect. Laura replies: Yes, you can use magnetic decorations on the stateroom doors.